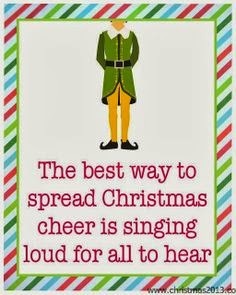 Elf is hands down my favourite christmas film of all time. ever. evererer. It is a tradition in my house to watch it on the 1st December whilst we put the tree and decorations up. I'm pretty sure that I know most of the words off by heart, and I still cry with laughter every single time i see the scene where Buddy gets stuck on the escalator. Oh and who on earth knew that Zooey Deschanel played Jovie?!?!?!?! Well I didn't know until I was told last week...oh. Anyway, I just felt the need to rave about this amazing film and it really is something I look forward to watching every year. It never gets old.